Tax season is over (finally), and many consumers are looking forward to receiving their tax refunds. It’s easy to get impatient when you are waiting for money, especially if you plan to use it for something specific. If you are curious about where your refund is, the good news is that the IRS has a way for you check your refund. How Fast Will I Get My Refund? Technology has made it easier than ever to get your refund faster. However, the way that you file your taxes has a big impact on how fast you can expect to receive your money. If you e-file, you will receive your refund much faster. Those that send in their tax returns in hard copy have to wait longer. First, you have to wait for your tax return to reach the IRS processing center. Then you have to wait for someone to enter the information into a computer. And then your refund is finally issued. An e-file is much faster. Since it’s handled electronically, it is entered almost instantly into the system, and the issuance of your refund can go forward at a quicker pace… and with smaller chance of human error factored in. Another factor in how fast you will receive your refund is the way you opt to receive your refund. If you want a paper check (an option that could disappear soon, with Social Security checks no longer delivered by paper check), you will have to wait for it to be cut. The fastest way to receive your tax refund is via direct deposit. You can have your refund put into the account of your choosing, or even added to a prepaid debit card. If you want your refund as fast as possible, e-file and ask for a direct deposit. The slowest way is to send in a paper return and ask for a paper check. This is especially true if you waited until the last minute and the IRS processing center is backed up with all the other last-minute returns. So, Where is My Tax Refund? Once you have filed your tax return, it’s possible to check the status of your tax refund later. 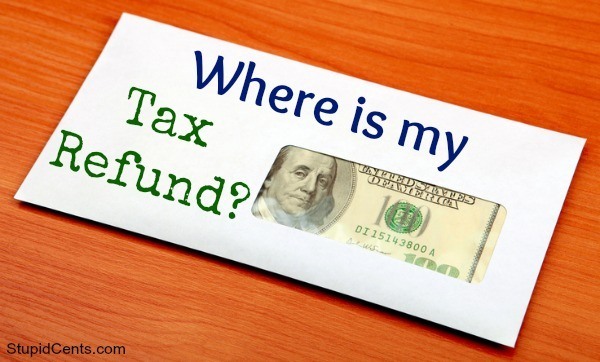 The IRS has a where’s my refund feature that allows you to check online. However, you can’t check until 24 hours after you have file your tax return electronically. If you filed a hardcopy return, you will need to wait four weeks from the time you mail your return to check the status. This is information that you should have on your copy of your tax return. Enter the information, and the IRS will let you know the status of your refund. In addition to telling you where your refund is, and when you can expect to receive it, you can also see what mistakes need to be corrected. The “where is my tax refund” tool can show you if a mistake has been made (such as in your address, or in your bank’s routing number), and how to correct it. If you haven’t received your refund by the appointed time, use the trace tool to see if you can figure out what went wrong. There is no reason to sit in the dark about your refund. You can find out what you need to know from the IRS, and take care of problems that arise.